among us who are food insecure. located at the Northwest corner of campus, just across the street from the large parking deck. There is plenty of free parking available there. Please fill out the information below to ensure your participation. Space is limited to 150 people on first come first serve basis. Are you interested in helping support this event? Feel free to make a donation directly to Outreach. Donations are tax deductible and not mandatory to attend the event. Trinity Volunteer Corps.is partnering with Outreach, an international 501(c)(3) non-profit, which has packaged and distributed over 300 million meals to hungry children and their families since 2004. 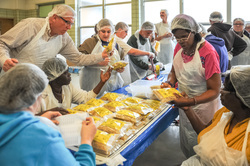 Through its innovative mobile food packaging program, Outreach brings together hundreds, sometimes thousands, of volunteers - in church halls, school gyms, and conference centers - each prepared to donate time and money to package meals for the hungry. These are extraordinary spirit-enriching events of giving and caring in which any one of any age or background can participate and extend love to those in need. Meals are distributed to the hungry and food insecure locally in our community.